I was watching a TV show this week where everyone was trying to politically correct about the holidays, trying not to offend anybody’s beliefs. It was brought together in a pretty funny way without being disrespectful. At one point, one of the guys trying to be festive and not offensive parades into a room and proclaims his greeting, “Merry Happy!” Funny commentary on our culture, I think. Our services this weekend are feeling festive because of the decor and the general sense everyone brings with the season this time of year. My favorite Christmas song is O Come All Ye Faithful and it was great to have it as part of the set. Our bands and tech teams did a great job in putting on all 3 of our services. I’m thankful for so many great people committed to this ministry. 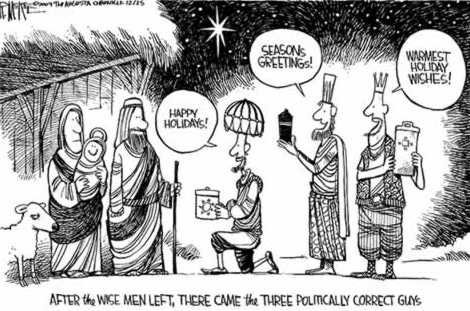 I’m entertained by how obvious it has become an awkward issue this time of year, and how there are people (even in the secular world) who mock the PC nature of our culture. Good stuff, Andy–thanks for sharing! And I personally have a bone to pick with anyone who gets antsy about the “Merry Christmas” issue… why can’t they understand that the holiday wasn’t MADE for them? It was MADE for HIM!